Mindy Starns Clark is the bestselling author of more than 20 books, both fiction and nonfiction (more than 800,000 sold) including coauthoring the Christy Award–winning The Amish Midwife. 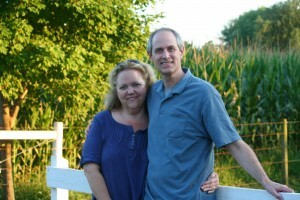 Mindy and her husband, John, have two adult children and live in Pennsylvania. Visit Mindy at her website: www.mindystarnsclark.com. Welcome, Mindy—happy to have you here today! You mentioned in your interview on the Harvest House blog in August that your husband came up with the initial plot idea for this story. What was it about the premise that really resonated with you and Susan? Did your husband continue to give input during the writing process? Mindy: Anyone who watches the book trailer will probably find the idea resonating with them as well. (It’s my favorite book trailer ever!) I was just so drawn to the idea of a man truly torn between two worlds and having to decide in which one he belongs. Our main character, Tyler, is the son of an ex-Amish woman and a military man. When Tyler is six, his mother dies, and his father—who is about to ship off overseas—sends him to live with his mother’s parents, the Amish grandparents he never even met until his mom’s funeral. Just like that, Tyler’s whole world changes. And though the arrangement is supposed to be temporary, it ends up lasting for years. Our story opens as Tyler is in his early 20’s and is at the point where he has to make a decision. Is he Englisch, like the family he was born into, or Amish, like the family that has raised him since the age of six? The question of whether or not to join the church isn’t an uncommon theme in many Amish novels. But this angle of really having one leg in each world brought a whole new dimension to it for me. As for my husband’s ongoing input, absolutely, I couldn’t do my job without him. He’s so great at plot ideas and story shaping and pacing. I call him the “Story Doctor.” He can fix almost any issue, small or large, just by helping me reason through the problems or questions and offering up solutions. With this series, he’s been especially helpful, because he’s also our designated “male reader,” the one who makes sure our male characters don’t say or do anything that seems unmanly or doesn’t ring true for the male psyche. Did you draw from any real-life examples for any part of the story? Mindy: I imagine bits and pieces of every story come from real life in one way or another. But I guess one scene in this book that comes to mind is when Tyler is out in California, staying at his dad’s house, and he accepts an invitation to church from a twenty-something young woman whom he has befriended. It turns out to be a megachurch with a super modern, young-adult-oriented service complete with videos and a Christian rock band and everything. In other words, it is the complete opposite of the very quiet, very somber, very multigenerational types of Amish services that Tyler is used to. It was fun to see such a startling contrast through his eyes and then have him process the whole idea of what worship looks like to different people. The idea for that scene came from a church we visited in Lancaster County during a research trip for the book. Though our home church falls somewhere right in the middle of the two extremes, we’d been planning to attend a conservative Mennonite church while there, one that had been recommended by friends. We were running late, however, so we ended up having go to a later service at a nondenominational church instead. As it turned out, that place was rockin’, with a full-on multimedia assault. It was great—as I’m sure the Mennonite church would’ve been as well—just extremely different from the worship service we’d been expecting! Most Amish romance novels are either from the heroine’s point of view, or both hers and the hero’s. Since most readers of this genre are female, what’s the appeal in seeing the story strictly through the hero’s eyes? Mindy: I think it’s just really important to view “life” through a completely different lens sometimes, so to speak. Avid readers of Amish fiction are a savvy bunch and have acquired all sorts of knowledge about the Amish life through the stories they’ve read. But experiencing these same kinds of elements from a male perspective really does offer a fresh and unique take on the subject. It’s fun and fascinating. For example, in the early chapters of the book we go to an Amish wedding, which is not an uncommon element of an Amish novel. But rather than seeing it through the eyes of a young woman, perhaps one who is single and hoping to sit with the guy she likes or whatever, we’re seeing it through a man’s eyes, where we learn about the rejection factor and how it feels when a guy asks a girl to join him and she turns him down. Simple touches like that make a really fun difference and offer a whole new take on familiar components. On a deeper level, telling stories from a male viewpoint allows us to explore more male-oriented issues such as the father-son bond, or the balance between being strong and allowing oneself to experience deep emotions, or the matters to be weighed prior to making a marriage commitment. These are all things that men deal with, yet women are deeply interested in them as well. Hopefully, these stories will offer insights that both men and women find satisfying to read—and that may even be useful in real life! It’s probably safe to say that most people who pick up this novel would never have to choose between the Amish love-of-their-life and the freedom of the Englisch. How might they still be able to relate to and learn from Tyler’s struggles? Mindy: I think as we grow, each of us reaches some point where we find ourselves transitioning from that person our families molded us to be and/or expect us to be and the person we really are as independent adults. It’s a rite of passage for everyone, Amish or not, so it’s a common struggle and one that will likely resonate with most people. 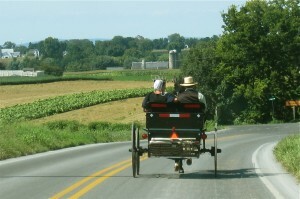 What’s one of the things you appreciate most about the Amish lifestyle? Mindy: The peace and quiet! Amish life is engineered to allow plenty of time for prayer, meditation, reflection, and the like, and though there are certainly the sounds of conversation and daily life and various appliances and machines running from alternative power sources, there’s nothing digital, which makes a tremendous difference in the overall volume level. Imagine how much quieter your world would be without any phones, televisions, computers, iPads, video games, etc. It’s a kind of silence that many of us forget can even exist! Just the difference between a calm, slow buggy ride and a mad dash in the car—radio blaring, GPS directing, phone ringtoning, and more—is like night and day. I doubt I would ever have the strength and discipline to unplug quite so completely, but I do enjoy the quiet tremendously when visiting Amish homes. They also cook some pretty amazing food too. Thank you for taking the time to visit with us, Mindy! Photos from Amish country courtesy of Mindy Starns Clark. Top photo is of Mindy and her husband when they were conducting research on an Amish farm. Looking forward to reading this book. It sounds really good. The Amish lifestyle seems so peaceful and their farms are so beautiful. Their life is slower and with no electronics. There is definitely an appeal in the peacefulness of a life without electronics, isn’t there? Hope you enjoy the book, Deborah! Amber, when ever the power goes out it seems so quiet and peaceful doesn’t it? True! Sadly, it can be stressful when the power/Internet goes out when you’re in the middle of projects, since we’ve become so dependent upon the ability to “plug in”… But yes, everything gets so quiet and still, almost like going back in time. I think that “glimpse from the past” is part of the appeal of the Amish lifestyle. I enjoyed the interview and getting to know Mindy a little more. I really loved watching The Amish Groom trailer. I don’t know why but I found myself tearing up! Happy to hear you enjoyed the interview, Judy! And this is one of the more touching and thought-provoking trailers, for sure. I love it, too! I did too, Judy! I just think it’s the best trailer ever. I think what I enjoy most about the Amish life style is that they don’t let worldly things and possessions come between them and worshipping God. They live a modest , humble lifestyle. They can most of their fruits and vegetables from their gardens to last through the winter. Their heads aren’t turned by the latest fashions , fancy cars or big expensive houses. They work hard and live within their means. I just love that they use a horse and buggy. This means they’re not going about in such a hurry to get somewhere and in a buggy they get to see more of the country side and the nature around them. I love it when we visit the Amish community in Adams county near where we live. It’s great to see them out on the road. The Amish food and especially the pies and desserts are out of this world. They make all their own bread. That is so cool. I love reading Amish books and I’ve read one of Mindy Stern Clarks books this year. Hope to read a lot more in the future. Thanks for your comment Shirley, I agree with everything you said. There’s a lot to appreciate about the Amish! Like Mindy said, you make a lot of great points, Shirley! While we all have our faults and issues – Amish or Englisch – there is something very appealing about the simplicity of the Amish lifestyle, along with the strong work ethic and the emphasis on community. That’s wonderful that you get to visit local Amish communities – and enjoy their cooking! 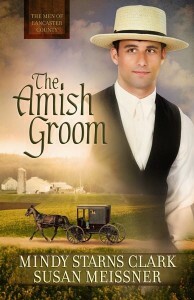 Some men read our wonderful romances in the Amish communities. How exciting that the authors have made the decision/commitment to write from the male perspective. Too many times when I read I wonder, “would a guy really think/act that way?” We realize men can’t think like a woman, I wonder why we think we can think like them? I’m so glad Mindy’s husband is willing to be the male-think -filter. Sure do appreciate his willingness to help make the story ring true. It is really exciting to see new perspectives in Amish fiction, isn’t it? And it was great of Mindy’s husband to assist in having the point-of-view sound authentic. Thanks for commenting!